On Saturday, April 20, Santa Clarita Valley residents can flex their free-throw skills at an event benefitting local Special Olympics athletes, veterans and first responders! How can free-throws benefit so many people in the community? 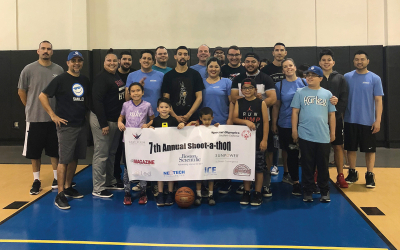 Celebrating its 8th anniversary, the Shoot-A-Thon invites residents, schools and businesses to partner with Special Olympics Santa Clarita and Tri-Valley in benefiting both their own athletes, as well as the Gary Sinise Foundation. It’s easy, simply collect pledges for the shots you are going to make. Participants will have one hour to reach or exceed their free-throw goals and contribute to Special Olympics’ overall goal of 10,000 baskets. Besides basketball free-throws, plenty of other activities will be offered as well. Local TV personality, Dave Caldwell, will serve as the emcee for the fundraiser, which features music, a silent auction and a half-court shot raffle. As a special guest appearance, some of the Laker Girls are also expected. The event will be held from 10 a.m. to 3 p.m. at the George A. Caravalho Santa Clarita Sports Complex, located at 20870 Centre Pointe Parkway. Thanks to participant pledges and local sponsors, this event has been an extraordinarily fun and successful fundraiser each year. Sponsors have included Boston Scientific, Bernards (Builders and Management Services), and John Paul Mitchell Systems. This year we are also building on the number of ‘corporate’ teams participating. Just a partial list includes: Boston Scientific, Neotech, ICE Recovery and Wellness, and SCV Quakes. 1. It is one of the first events of its kind where Special Olympics athletes participate in a fundraiser benefitting other groups. It is an opportunity for the dedicated athletes of Special Olympics to ‘pay it forward’ to our veterans and first responders. 2. By providing an opportunity for all athletes to work together towards a unified goal, the event creates an atmosphere where stereotypes are broken down and a sense of shared purpose and community is developed. Get involved in this great event as a participant, donor or event sponsor, by visiting www.sosc.org/ShootAThon or calling the Special Olympics office at 661-253-2121.